Vice President Yemi Osinbajo on Wednesday advised state governors to work closely with the Police to set up schools protection unit, to prevent further attacks and abduction of school children. The vice president gave the advice in a message to the opening of Northern Nigeria Stakeholders Security Summit, held in Kaduna. Osinbajo, who was represented by Sen. Babafemi Ojudu, Special Adviser to the President on Political Matters, said governors across the country should directly support the police by setting up the schools protection unit. He stressed that the Federal Government remained firmly committed to the protection of all Nigerians, including the safe return of the abducted Dapchi school girls. He said the police needed support from all fronts considering the multi dimensional security challenges bedevilling the country. “If political officers are given adequate security, all public and private schools across the country must also enjoy the same. “We must as well protect children, so that they do not have the impression of being neglected, we should not allow their psyche to be brutalised or traumatized by hoodlums,’’ he stressed. In his address, the Chairman, Northern Governors Forum (NGF), Kashim Shettima, said the event would explore options for community policing, as the police are over stretched for reasons of competing demands. He commended President Muhammadu Buhari, the military, police and other security agencies for their efforts in curbing criminalities and insurgency. On his part, Kaduna State Governor, Nasir El-Rufai, described the summit as a timely opportunity to collectively examine the security challenges facing the region. “While the North-East has begun an admirable recovery from the ravages of terror, the recent abduction of young girls in Dapchi is a painful reminder that evil has not given up”. Represented by his deputy, Bala Bantex, the governor noted that apart from the loss of lives, the bonds of trust that enabled communities to easily uphold harmony and concord risk being broken. “And the cycle of violent conflict scares investors away and slows much needed growth and development in the states,’’ he added. El-Rufa’i said that Northern Nigeria must strategize on how to confront challenges facing the region together and work towards ensuring security and peace. 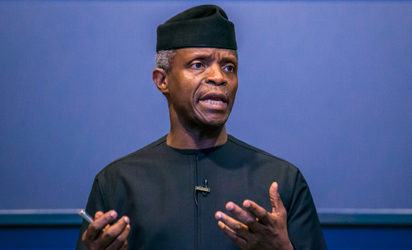 The post We’re saddened by missing girls story, support police to protect children – Osinbajo appeared first on Vanguard News.